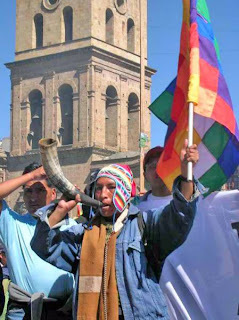 Solon explained it was this belief that motivated Bolivia to host an historic World Peoples’ Summit on Climate Change and Rights of Mother Earth on 19-22 April 2010 to which more than 15,000 people and up to 70 governments are expected to attend. “The central aim of any climate summit is not to save itself and accept any outcome, but to come to an agreement that will save humanity.” Solon said that the Copenhagen Accord sadly marked a “backwards step” so could never be acceptable as a basis for further negotiations. Solon pointed out that the European Union’s own analysis of the Copenhagen Accord admitted that it would lead to an increase of temperatures of up to four or five degrees. Solon reiterated the demands of many developing nations by calling on industrialized nations to rebuild trust. “You cannot rebuild trust by legalizing the same methods that led to the failure in Copenhagen.” Solon called for talks to be returned to the full UNFCCC process, and to develop on what had been agreed in COP15.